Form the habit of slightly overdressing for every occasion. In today’s climate, you may be vastly overdressed compared to some, but someone must set the bar. Be that one. Invest in some terrific casual clothing. Polo shirts with shorts or jeans are fine for watching your children play baseball, attending an outdoor festival, or making a quick trip to the grocery store, but too many grown men regularly dress as if they were in 3rd grade. 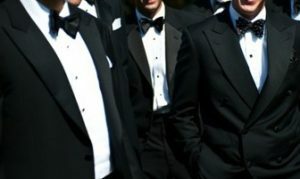 If you are going to attend a function where “business casual” is specified, then wear a jacket and tie. If it’s to be “casual,” then wear a blazer without a tie. Then when some goofball in a t-shirt, worn out shorts, and flip-flops says, “I thought it was supposed to be casual,” you can politely reply, “Yes, that’s why I’m not wearing a tie. Have your shirts laundered professionally. Ask for medium or heavy starch. Choose a collar style that is appropriate for the style of clothing it is to be worn with. 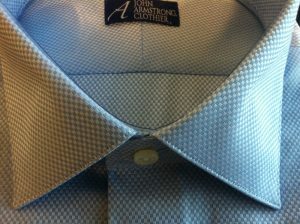 A good rule of thumb: Point, spread and tab collars are dressier than button-down collars. Button-downs are okay for sport coats or khakis. They’re not so good for suits. Never wear a button-down collared shirt with a very dressy suit, such as a double-breasted or shadow stripe. 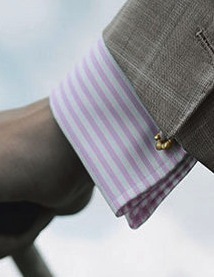 French cuffs add a distinctive, elegant look and are appropriate with any suit and most sport coats. All knots should be tied with a dimple in the center. One creates a dimple with his index finger as the knot is formed and tightened. The tie should always be long enough that it extends to the middle or to the bottom of the waistband. A bit longer is better than a bit shorter when it comes to neckwear. When removing your tie, don’t pull the knot until the small end comes through the knot. Doing so is harmful to the tie, setting wrinkles, and often breaking the bar tack. Instead, loosen the tie slightly by pulling on the knot. Then untie the knot by reversing the procedure used to tie it. The first knot tied in a new tie is the most important because the lining has “memory,” which causes the knot to form the original knot set in the tie each time you tie it thereafter. So, if you don’t like the length or the look of the knot the first time you tie, untie it and try again until you like it. Your subsequent knots will be very much like the very first one you settle on. Your shoes should always be clean and well polished. If you don’t know how to put a good shine on your own shoes, go to a good shoe shine man and have them done frequently. Appropriate shoe style is dictated by the style of the clothing to be worn. A lace-up is generally more appropriate with a suit, and slip-ons are generally more appropriate with a sport coat or casual clothing, although there are exceptions. Some styles are more transitional, meaning that they are appropriate with either a suit or sport coat. Tennis shoes and running shoes are not casual shoes. They are athletic shoes. 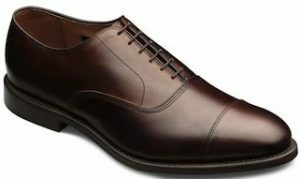 Park Avenue by Allen Edmonds in Dark Brown. An fine example of a suit shoe, this color is perfect with a Charcoal Suit. Allen Edmonds Carlsbad in Chili. 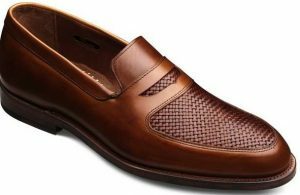 Slip-ons are generally less than ideal to wear with suits. Delray by Allen Edmonds in Dark Brown. 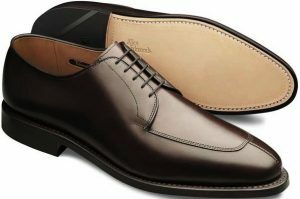 This blucher style is a good transitional shoe. With dress clothing always wear over-the-calf socks. As a general rule, your socks should either match the color of your trousers or your shoe. With a casual khaki pant, a cream color sock is fine with a casual light brown loafer. If your trouser has belt loops, you must wear either a belt or braces. Never wear both at the same time! If your trouser has no loops, you may choose to wear braces or not. Braces should always button inside the waistband of your trouser. Do not wear the kind that “clips on” to the waistband. The color of your belt should match or nearly match the color of your shoes. Braces do not need to match anything else, but the color and pattern should not clash with the rest of the ensemble. There are dress belts and casual belts. Wear them accordingly. Carry and use a nice pen. It enhances your image, and it makes you feel good. Wear a pocket square of linen or silk in your coat breast pocket for a finishing touch, which speaks to your attention to detail. White linen is always appropriate with a suit and most sport coats. If you choose a color other than white, it should complement but never be an exact match to your tie. What about mixing patterns? Should you wear a striped shirt with a striped suit? What about paisley ties? 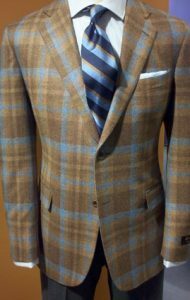 This handsome ensemble includes a large plaid jacket, checked shirt, bold stripe tie, and solid grey trousers. The simple white linen handkerchief in the breast pocket looks great. When done well, wearing a mix of patterns and colors adds zest and panache to your sartorial style. If you are feeling confused about what goes together, you are not alone. While some caution is warranted, you don’t need to be intimidated by mixing patterns. Keep the following guidelines in mind, and with some practice (and maybe with a little help from your clothier), you can learn to confidently and artfully blend patterns with ease. 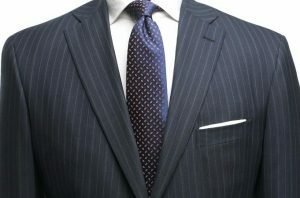 It’s fine to wear a striped shirt with a striped tie or a striped suit, as long as the stripes aren’t too much alike. Wear a narrowly-spaced stripe shirt with a widely-spaced stripe suit, for example, or vice versa. Checked shirts can look great with pinstriped or chalk striped suits, as long as the scale of the patterns isn’t too similar. If you aren’t sure about a combination, lay it out together on the bed and stand back to look at it. If the blend of colors and patterns pleases the eye, then it is probably good. If, on the other hand, the patterns compete for your attention, you’ve probably overdone it. In that case, remove one of the patterned items and replace it with something more harmonious. Some of life’s most important occasions are celebrated while wearing a tuxedo. Make sure yours is a nice one! And be sure to work with a clothier who knows formal-wear. All of our clothiers at John Armstrong, Clothier have the formal-wear expertise to guarantee you will like the photos of your most memorable occasions for years to come. A wedding party who are not matching but still look great! Ralph Fiennes at the London premiere of the James Bond film, Skyfall, wearing a midnight navy tuxedo with shawl collar. Elegant and Timeless!.